Music from Indonesia is now available around the world for the first time. 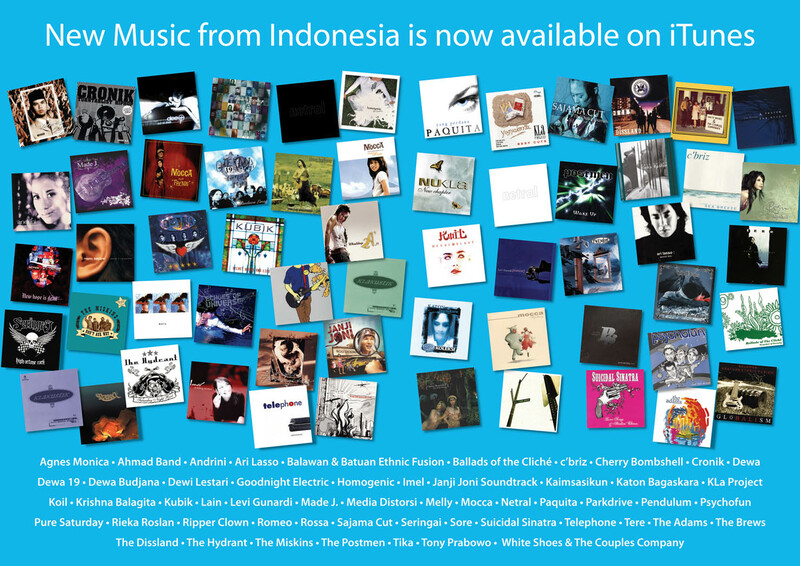 Starting today, songs from more than 60 Indonesian artists are available for purchase through the iTunes Music Store. From Bali rockabilly to Bandung electronica to Jakarta metal, this unprecedented catalog can now be enjoyed by music fans in every corner of the globe. Equinox Publishing, Indonesia's leading English-language book publisher, announced today it launched a new service to distribute and promote Indonesian musicians. Equinox Digital Music Distribution (DMD), has already signed distribution agreements with most major Indonesian labels like Musica Studios, Aquarius Musikindo and Pro Sound Records, as well as many up-and-coming indie labels like Aksara Records from Jakarta, Fast Forward Records from Bandung and Electrohell Records from Bali. This catalog forms Southeast Asia's largest selection of music to arrive on the digital music landscape and will be accompanied by a free podcast entitled “New Music from Indonesia by Djarum” and hosted by Jason Tedjasukmana, a well-known journalist and indie music expert. The weekly podcast debuts today and is available for download from http://www.EquinoxDMD.com as well as through Apple Computer's iTunes. Equinox Publishing, founded on the Autumnal Equinox in 1999, is the leading English-language publisher of books on Indonesia with more than 40 titles to date from authors such as Nobel prize candidate Pramoedya Ananta Toer, terrorism expert Ken Conboy, and novelist Ayu Utami. Visit http://www.EquinoxPublishing.com for more information. We have prepared hi-res images of all the album artwork and can arrange interviews with individual band members upon request. Equinox DMD LogoThis is a hi-res version of Equinox DMD's logo. Equinox DMD ArtistsThis is an image of all the Indonesian artists now available on iTunes. Podcast LogoThis is the logo of the "New Music From Indonesia" podcast. PDF version of the Press ReleaseThis is a PDF version of the Equinox DMD press release.